SKIN: Chrissy's skin doesn't need much, so I didn't do much to it. I love the texture of her skin, so I wanted to emphasize that by highlighting her cheekbones and giving her skin a subtle overall glow. 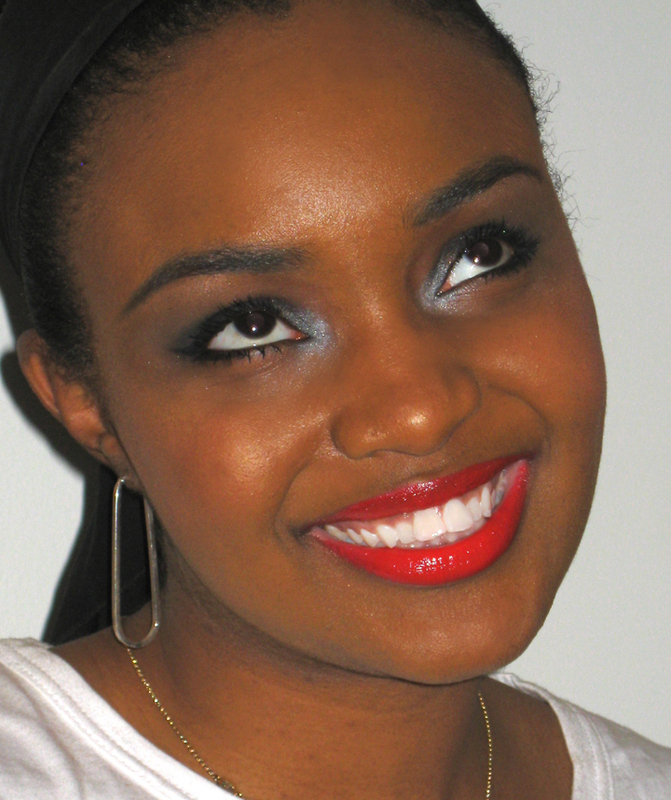 I used a shimmery Coastal Scents bronzer on the sides of her forehead and also as a blush on the apples of her cheeks. Then, I highlighted with a purply MAC mineralized blush just on the tops of her cheekbones. Tip: Using a shimmery bronzer on dark skin will give it a healthy natural glow and can double as a blush. If your skin is oily, keep the shimmery bronzers and highlighters away from the t-zone and stick to just the contours of the face, as I did on Chrissy. EYES: Christen's eyes sit on her face at an angle, which is so cute and cat-like so... again, I was inspired to draw attention to this unique feature. 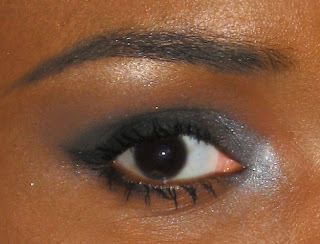 Taking a shimmery black eyeshadow (Creep) on a flat stiff brush, I packed it on her lid, leaving the inner third blank. Next, I cleaned the brush and packed a gunmetal eyeshadow (Gunmetal) to the empty inner third of her lid, as well as to the inner corner and a bit under the inner lash line. See pic. With a fluffy dome shaped brush or contouring brush, I applied a soft brown shadow (Buck) all over the crease and up to the brow. Using circular motions, I softened the harsh edge of the black shadow, blending it with the brown. Tip: This color is close to her skin tone, so the transition between the black shadow and her skin becomes more natural. Taking a pale shimmery eyeshadow (Virgin), I applied it just to the inner corner of her eye, to brighten up the gunmetal and directly under the high point of her brow and blended it with Buck. Next, I lined underneath her lower lash line using a black gel liner, making it thicker in the outer corner and created an exaggerated cat eye liner on the top lash line. I finished by applying two coats of mascara to the top and bottom lashes. 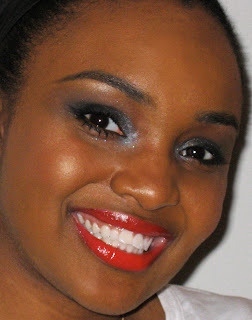 THE LIPS must be red to frame such white teeth and a gorgeous smile :D Voila! ❤ As an added bonus, Fix Your Face by Maryam Maquillage is proud to share with you a video of Christen singing "Let It Be" for the Avon Voices competition. Check it out and vote for this Starry Eyed Starlet on the Avon website!!! 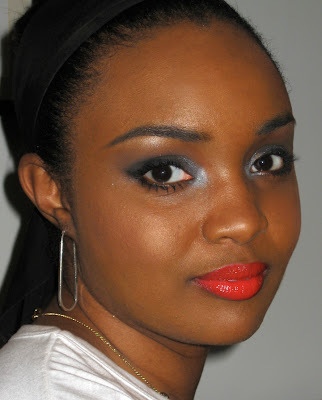 Also, get to know Christen at her blog C. Satchelle. I LOVE MY FRIENDS!!! 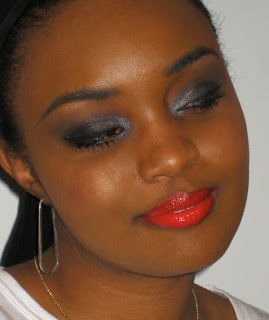 i love this look the red lips are so beautiful!!! Really pretty, both the make up and Christen. You did a great job with her makeup. thanks!! @emily, yes a beautiful model makes it quite easy indeed!! !